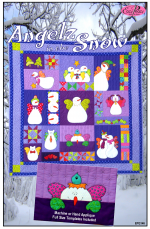 Friend and fellow designer Sally Johnson will be teaching Eazy Peazy’s “Angelz in the Snow” quilt pattern and with a something added to spice up the presentation. During part of the class time Sally and will make a call to me using Skype, giving her students the opportunity to ask questions and show their works-in-progress. In case you aren’t familiar with Skype (and I wasn’t until about a month ago) it is an Internet-based audio/visual communications program that’s “Eazy” to set up on an iPad, tablet or laptop. Best of all, Skype software may be downloaded for free. So the next time your quilt shop schedules a class teaching an Eazy Peazy pattern please let me know and I will be happy to Skype with you and your students. It a real opportunity to add value for your students at no cost to you. Valentine’s Day is almost upon us and here is a personalized gift you can make in almost no time. Take a look at the “Love U More” from Cut Loose Press. It’s a mug rug with a message and your own special message tucked into the fabric envelope. To make it all you need are a Bosal Foam & Fiber Circle Mug Rug (Craf-tex) - 8" diameter, two fat quarters and a few fabric scraps. Having a Trunk Show? We all know samples sell, so why not put samples…ones you don’t have to sew…on display with an Eazy Peazy Trunk Show? We make it Eazy by sending samples of your choice at no cost, all you pay is shipping back to us. We’ll do the rest. Click here for all the details.